Doves are kept as pets all around the world, and can make a great pet if the owner makes some effort to provide a healthy and safe environment for these birds. In general doves are not demanding like some other pet birds. Doves are kind and mellow, and make great friends. Pet doves will get attached to the owner and will be companions for life. Doves like other doves and humans alike and build close relationships with them easily. From these two ringnecks are larger than the smaller diamond dove, but the care is very similar and both can be kept successfully in homes. If you keep doves you will have to make room for the birds in your home. First off all you have to decide to keep them indoor or outdoor . The ringneck doves are more similar to the wild mourning dove and can take more extreme cold weather if kept outdoors. The diamond dove is native to Australia and is used to warmer weather, so if you live far north where temperatures are extreme put them inside for the winter. If you keep doves as pets inside your home, I recommend to give them free flight from time to time. Doves will exercise their wings and interact with you when out of the cage. Like for other pet birds you will need the same requirements to keep doves in your home. Doves need housing where they will live, food, water, and some love. This Doves (Complete Pet Owner's Manual) is a good choice for pet dove owners. If you plan to keep doves as pets but just one bird make sure to find time to interact with her every day, doves love attention and will feel sad if left alone all day. If you cannot find time it is best to keep a pair so they can have a companion. Like all birds doves will fly, eat, and coo all day long and cannot be left alone to much. These birds are social and please provide them with a mate if you cannot find time yourself. 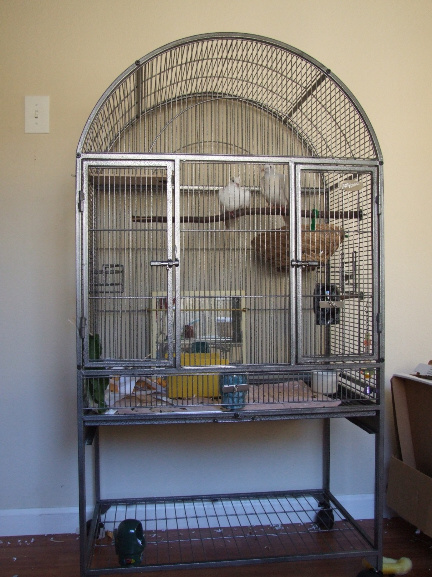 If you are going to keep doves as pets inside your home, you need a cage. Place the cage next to a window so birds can get lots of daylight but not all the time in direct sunlight to avoid overheating. But doves do love a few hours in the sun and enjoy it. If that is not possible for some reason use artificial light that is closest to sunlight, and provide the with minimum 12 hours of light. Keep them in some quiet place where you will not make to much noise, never keep them next to a TV or some other noise source. Doves like humans need their chill time, peace and quiet. 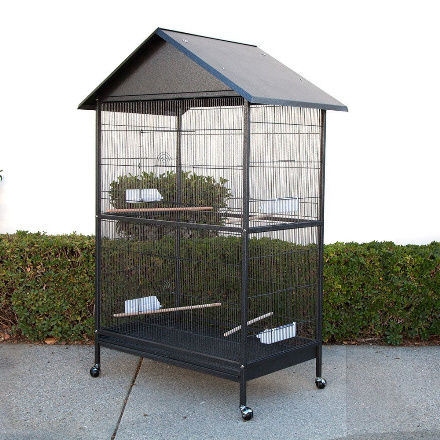 Get a Iron Flight Cage, X-Large made for large parrots so doves can fly inside, and let them out from time to time if you like. If you want to keep the outside you must provide them with a good place to house a cage or some other housing. Some people like to keep them in large flight cages where doves can have lots of room. Place them in sunlight but provide shade and provide a roof to protect them from rain, elements, and predators. Ringnecks will do well in cold weather, but Diamond doves will not if it is to cold. If you get snow in winter then it is best to keep diamond dove inside, if you never get snow than they will probably do fine outside. Doves love to spend time on the ground, just like pigeons, place some food on the ground and doves will enjoy picking thru the seed. It is recommended to place a nest bowl that doves can use for resting or having young. Place it higher and protected. Doves live to nest under some cover so predators cannot see them. Make sure you provide flight room, this can be done by installing perches far from each other. Get some plants so doves can feel at home. The best is to provide doves with as most natural diet as possible. Doves are seed eaters and most of the time will eat seed. There are great dove mix seed food you can get this Pigeon & Dove Seeds that is full of all the right ingredients for a healthy dove life. These dove mix are made specially for doves and are the best choice for pet owners. Include green food twice a week, like apples, lettuce, banana. Water must be provided at all times, never leave doves without clean water. If you have baby doves read this detailed section how to feed baby doves. Oats are the fundamental part in pigeon and bird count calories and are imperative for development and raising dovesl. Oats contain and are brimming with around 70% carbohydrate, 8-12% protein, 3-8% fat and 2-4% mineral and are extraordinary nourishment for birds. Oats are loaded with vitamins E and B yet to some degree poor in vitamin A (corn is a special case, as it contains vitamin A in its part). Wheat is exceedingly valued by pigeons and birds, however should be given in littler amounts then other nourishment, since it is rich and loaded with starches birds can get to be "fat" and have issues. Keep the wheat in the bird diet at lower sums. Corn is likewise an exceptionally refreshing grain in pigeon diet and an unquestionable requirement; it has a high vitality esteem that makes it great when doves are having babies, it is rich in proteins and starches and this will help the birds at winter. The corn has a high caloric value so don't over feed the birds with corn to decrease the possibility of "fat problems". Vegetable and fruit can be given twice a week to supplement the dove diet, these birds will love to snack on all types of fruit and lettuce. Your dove will be with you for a long time, and can live from 8 -12 years. 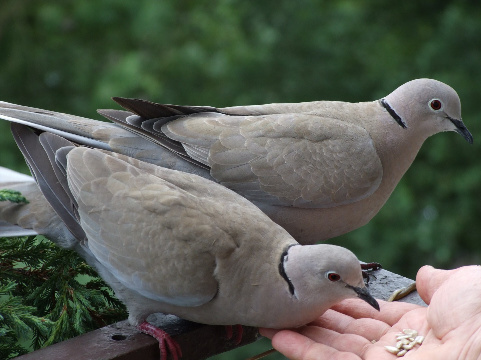 If you interact with them, doves can be great friends and will play with you. Elderly people find doves good companions, as well as children. If you keep a pair of doves, on breeding pair is the best choice, doves will have eggs a few times in season if allowed. Open nest bowls are good for doves, and you can buy them in most pet stores. Make sure to have at least one per cage. Doves will make their own nest if none is provided, in that case use a platform, and give them straw or dried grass for material. Doves as pets are easy to keep and great companions.